Accidentally, I read a review of the new Santa Fe by Hyundai in a national newspaper this week. The reviewer covered the main features, but took issue with the third row of seating. He spent a paragraph explaining that the seating in the third row is difficult to get to, and not a full seat capable of comfortably transporting grown-ups on long trips. He also concluded the entire review by focusing on that part of the new Santa Fe, literally making a tight third row the last word on the crossover. This is not unique. Constantly, the mainstream auto media comment negatively on the ability of adults to access and sit comfortably in the back of 3 row crossovers. Here’s the thing – do you know any families that have 7 or 8 adults in them? Is there someplace I’ve missed where 7 adults drive around together in one vehicle that is NOT an airport shuttle? 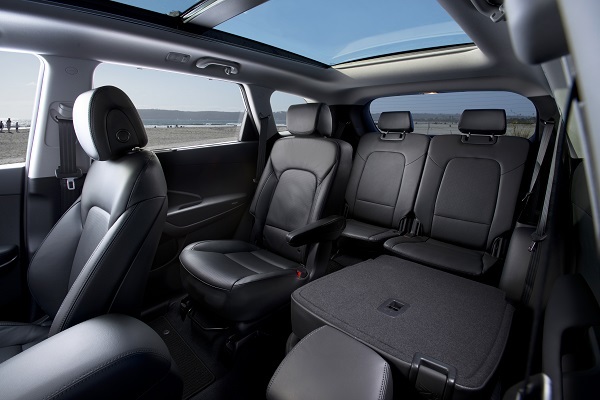 The third row of seating in crossovers is intended for use 99.99% of the time by the youngest, and smallest members of the family. Here at Torque News we refer to those as children. Children like to sit in the third row. To torture mine I make it off limits in my Highlander. When allowed to use it they race one another to get there first. If I am transporting their friends, say back and forth from soccer, they fight over who gets to sit there. Saying that the third row is not comfortable for adults is like saying a bicycle is uncomfortable for a fish (thanks Bono). Beware the auto writer who does not understand how vehicles are meant to be used. When one of the big 5 car magazines (Car and Driver, Road and Track, Automobile, Motor Trend, Autoweek) creates a comparison test they have a responsibility to get it right. Automakers take those results and bombard us with TV, radio, internet and print advertisements bragging that they won. If you are going to pick winners and losers, the cars tested should all cost about the same. Recently, one of them tested compact luxury sports sedans in a win/lose type shootout. They compared some cars priced in the high $40K ranges to some in the $60K ranges. Guess which won? Yup, the $62K BMW came out on top of cars that did not break $50K. Beware this type of thing when you research cars. It can give you a false sense of what cars are good and bad. There is one type of auto writing madness so general we won’t pick on any particular writer or media outlet. Suffice it to say if you are reading about an economy crossover and you read something like “On the skidpad, the Hauler AX tended to lean more than we like just prior to our brake -jab-induced oversteer maneuver” just put it down. The boy-racers who test passenger cars like they are race cars have good intentions. They think they care being scientific, but it is like a professional newscaster applying the same jargon to a mite learn-to-play hockey game. “Oh, Johnny really is going to need to watch his gap control and shorten up his shifts if he is going to survive in this league.” Sounds stupid right? It is. Passenger cars don’t need lateral acceleration ratings, and by even reporting the gas mileage the testers got while hammering cars on track they are confusing the public. The mileage a car gets during acceleration and brake testing is nothing like any person owning the car will ever get, so why scare the readers? Beware the boy-racer auto writers.